A renowned photographer who learnt his trade on Fleet Street photographing sportsmen, royals and celebrities – despite being legally blind – has spoken about his career at a university lecture. David Katz, from Ilford, has photographed a vast range of well-known figures, from the Queen to Barack Obama and Amy Whitehouse to Elton John. Starting as an office junior at 18, he rose quickly from taking pictures for his local paper at the weekend to become a celebrated Fleet Street photographer – with his career has spanning decades and taking him around the globe. However, until recently, David had hidden a secret from his colleagues – that he had been born legally blind. In a lecture to students as part of the university’s Creative Futures week, he recalled what his life had been like growing up with ocular albinism – a condition which meant his vision was sharply impaired. David also has astigmatism, nyastagmus and strabismus, each of which affect his vision, balance and more. However, he told the university’s packed William Aston Hall that his parents’ support had given him the grounding he needed to succeed in the competitive world of journalism. He added that his mother’s words to him as a young boy growing up – ‘There is no such word as ‘can’t’ – had inspired him throughout his career. “People often ask me ‘how can you do this – how do you see? It’s all a matter of perspective,” said David. “Some people have very good eyesight, but they don’t really see anything as they don’t pay attention. It really is about what you see when you are taking a photograph – not how far. “I remember speaking to someone about one of my pictures. He was talking about how much he liked it and I said’ yeah, not bad for a blind guy’ and he fell about laughing – he just didn’t realise. Throughout his talk, David showed a selection of that work, with a selection of pictures which made his name – from a streaker running past cricketer Ian Botham to Tony Blair playing guitar, and from a personal project marking the lives of Holocaust survivors to pictures of Nelson Mandela. 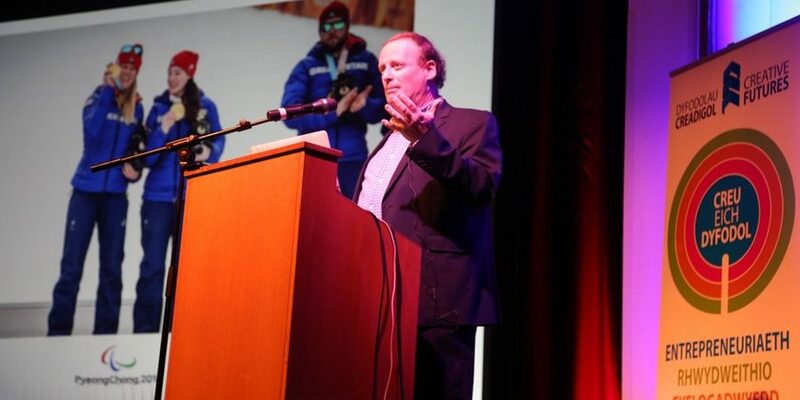 One of the pictures David used to close the talk was a picture he describes as his favourite, of Alpine skier and Glyndwr Honorary Fellow Menna Fitzpatrick at the 2018 Paralympic Games. It captures Menna – who, like David, is visually impaired – with guide Jennifer Kehoe, celebrating winning gold in the Slalom. During the Paralympics, David also spoke with Channel 4 about his life and work as a legally blind photographer. 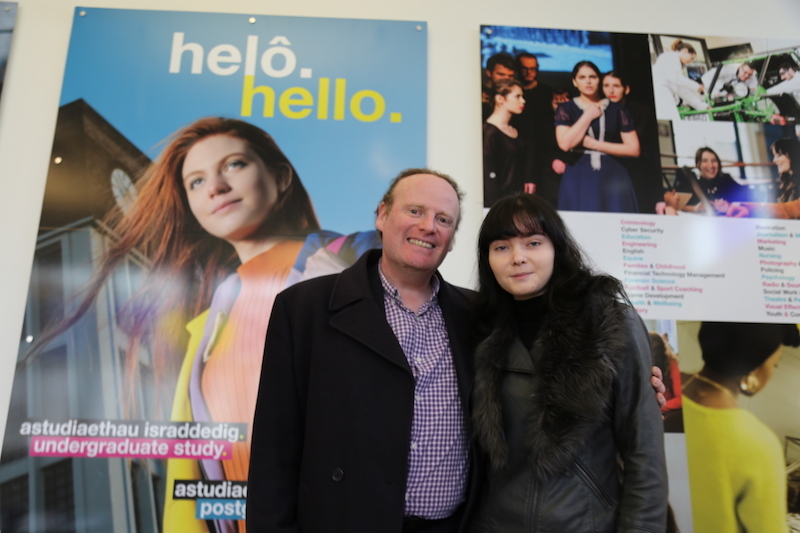 It was an interview which directly led to his appearance at the university after it caught the attention of student Isabella Nunns, from Deeside, who is in the third year of her Film and Photography degree and, like David, is visually impaired. David added: “This was a special event for me because of Isabella. When I launched my film, she got in touch and asked ‘would you come to my university’ – and that was one appointment I wanted to make sure I kept. Dr Karen Heald, Lecturer in Film and Photography at Wrexham Glyndwr University, added: “One of the things which made his talk so special for me is that David was speaking at our university as a direct result of Isabella making contact with him. David was speaking as part of Glyndwr’s Creative Futures week, organised by the university’s award-winning careers team. His website, and a link to his film Through My Lenses, can be found here. Find out more about Wrexham Glyndwr University’s BA (Hons) Photography and Film here.